It’s time to ditch your expensive outsourced printing and do it all in-house! This economical light-production system can make professional booklets and brochures with ease. Sharp’s top-of-the-line Polaris Pro series consists of the Sharp MX-6500N and MX-7500N. They print at 65 pages per minute and 75 pages per minute, respectively. They have several features and specs that set them apart from the competition. Not only do they have a smaller footprint, but they are capable of printing in ways that machines from other manufacturers simply cannot. 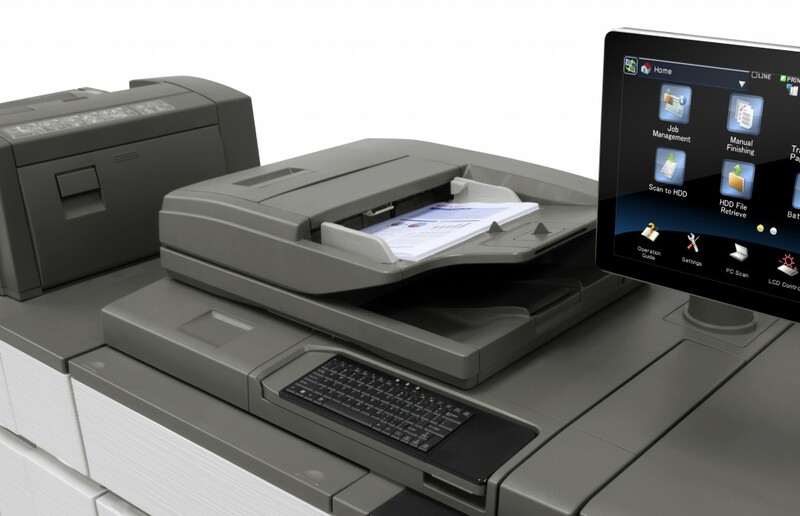 You’ll get all of the normal MFP functions like network printing in brilliant 1200 x 1200 DPI and network color scanning along with countless other features. Sharp Polaris Pro can print edge to edge (top to bottom) on an 11 x 17 sheet of paper. This is the first huge advantage over the competition. In heavy printing environments one of the biggest expenses is purchasing paper. Most full-bleed capable printers have to print on 12 x 18 and trim it down. You will save 30-40% on your paper budget buying 11 x 17 rather than 12 x 18! On the leading and trailing edge there is a 5mm white space for the machine to register the paper passing through, which is promptly trimmed off using the MX-TM10 trimming unit. The MX-FN22 saddle stitch finisher can staple up to 20 sheets when saddle stitching, effectively creating an 80 page booklet. The result looks like the image below. The Sharp MX-6500N, MX-7500N Polaris Pro boasts the smallest footprint for full-bleed printers in the industry. Configured with the options required for full-bleed booklets it is only 7 feet long. Of course there are several other options that can add additional functionality and create a larger footprint, but if space is a concern the Polaris Pro can fit in most workrooms with ease. The minimum configuration for booklet printing with the addition of a large capacity cassette is shown below. 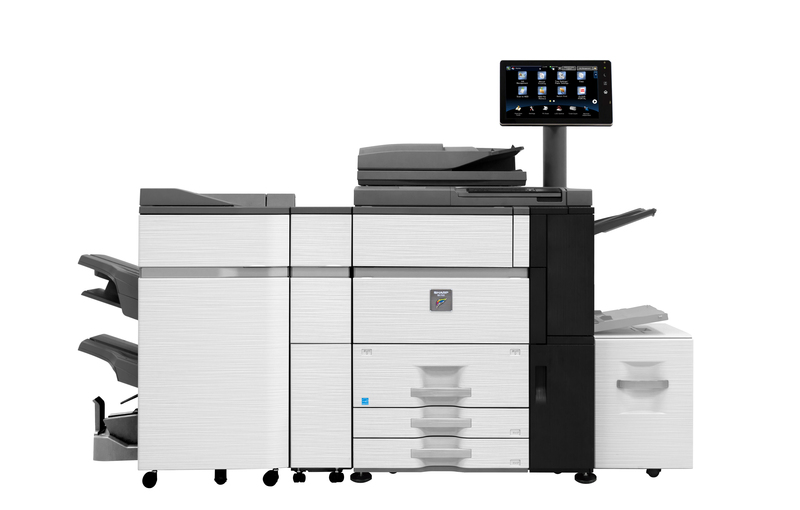 Sharp MX-6500N, MX-7500N Polaris Pro can print on countless types of paper. If you want to get really specific, you can download the Polaris Pro Media Guide, or scroll through it at the bottom of this post. This system is capable of duplexing up to 110lb stock. It can print on waterproof and tear-proof paper which is very handy for any gritty environments. Polaris Pro also has a built-in paper catalog to create custom paper settings for your exotic media. In these settings you can change the temperature of the fuser PER PAPER TRAY during a print job. This makes printing on glossy paper or any other normally “difficult” paper a snap. This is a unique feature for the Sharp MX-6500N, MX-7500N. The dual-head scanner can accommodate 150 sheets, and can scan up to 150 images per minute in both color and B&W. It scans both sides of a two-sided original in one pass without flipping the paper around. This results in greater productivity, fewer jams, and less wear and tear on your office equipment. If you have a job that is more than 150 sheets you can use the job build function to create larger documents. You can make use of the Sharp MX-6500N, Sharp MX-7500N Polaris Pro with or without a Fiery Color Print Server. If you decide to use the Fiery it integrates seamlessly with the touch screen display as seen below. No need for an additional workstation to be setup in your workroom; it can all be done from Sharp’s 15.4 inch hi-res display. There is a keyboard and mouse track-pad right on the front of the Polaris Pro for quick data input. The Polaris Pro toners yield 60,000 pages each at 5% coverage. This is 33.3% more than the MX-6240N supplies. The preventative maintenance cycle is over 300,000 pages. The life expectancy of Polaris Pro is 9,000,000 pages. That’s not a typo; 9 million. Print up to 150,000 pages per month. In summary, stop spending an arm and a leg outsourcing printing that you could do in your office. The Polaris Pro can produce anything your local print shop offers for an affordable monthly price. Create professional brochures and booklets to showcase your products and your company. 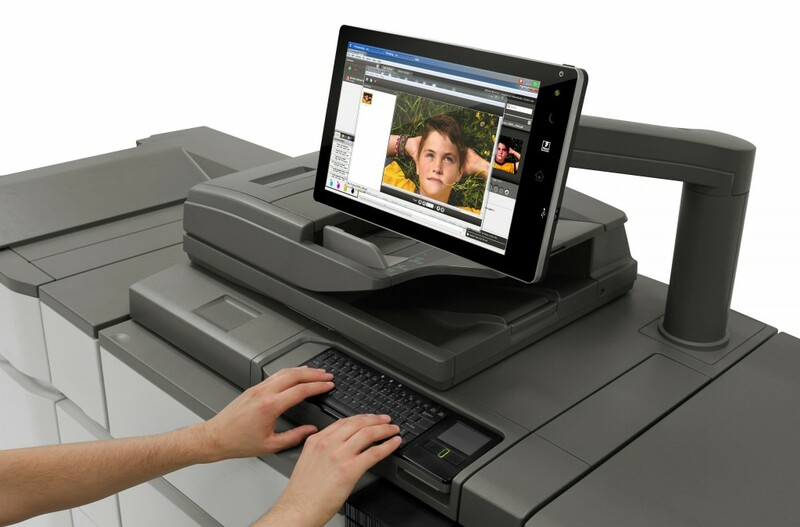 Sharp MX-6500N, MX-7500N can fit in most workrooms because of it’s small footprint. Feeds and prints on nearly every paper type, weight, and texture – including waterproof and tear-proof paper. Save big on your paper budget by substituting 11 x 17 in place of expensive 12 x 18 paper. Call our office at 281-351-5128 or request a free quote for your Polaris Pro today! We may have some follow questions since this system has so many features, so please include all of your contact information.